Karen N here from Craftily Yours. This month, here at Linnie Blooms, the design team was challenged to make a project that includes our favorite quote. Uhh. I don't have a favorite quote; I've never even given it a thought. LOL Sooooo, I pulled out some stamp quotes from Ranger, and I liked this one! I used a stamp I had from the (now closed) There She Goes line and some BG Serenade paper. 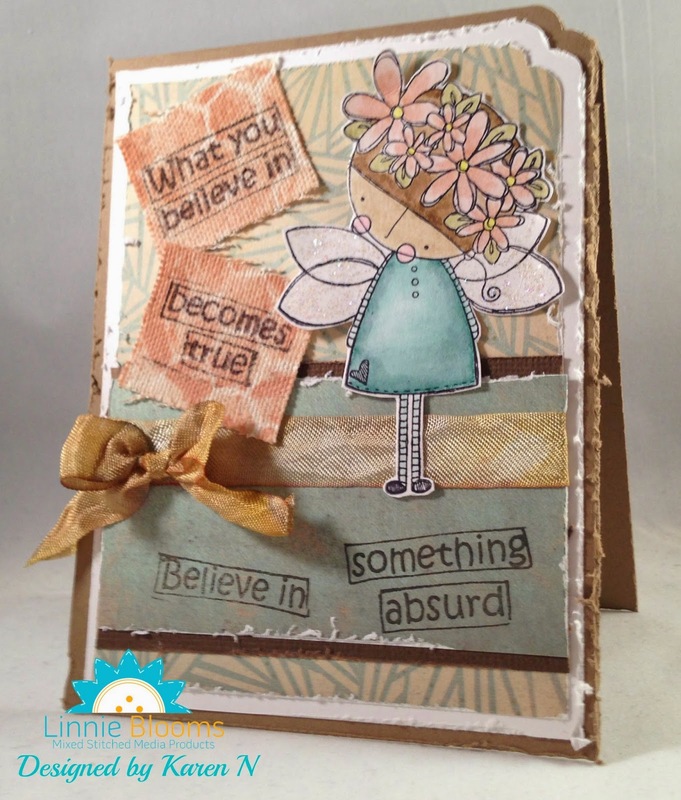 I colored the little fairy with TH Distress Markers and stamped part of the image on Linnie Blooms Canvas Shapes (square) that I had painted through a stencil with Tim Holtz Tattered Rose distress paint. The whole card is distressed with my Distrezz-it-All. I really love that thing!